Preheat your oven to 350°F, line a sheet pan with parchment paper or a silpat. Slice the Texas toast into strips of three. In a shallow dish, beat the eggs, eggnog, milk, melted butter, vanilla, cinnamon and nutmeg. Quickly dunk the slices in the batter and set on a wire rack to drip off any extra batter. Place all sticks on the prepared pan and place into your preheated oven for 15 minutes. Remove, flip and return back to the oven for 10-15 more minutes. Pour the maple syrup into a small bowl. Meanwhile, heat a small skillet over medium heat. Place the half a stick of butter into the pan. Watch closely until it is a deep golden brown. Remove and pour it into the maple syrup. 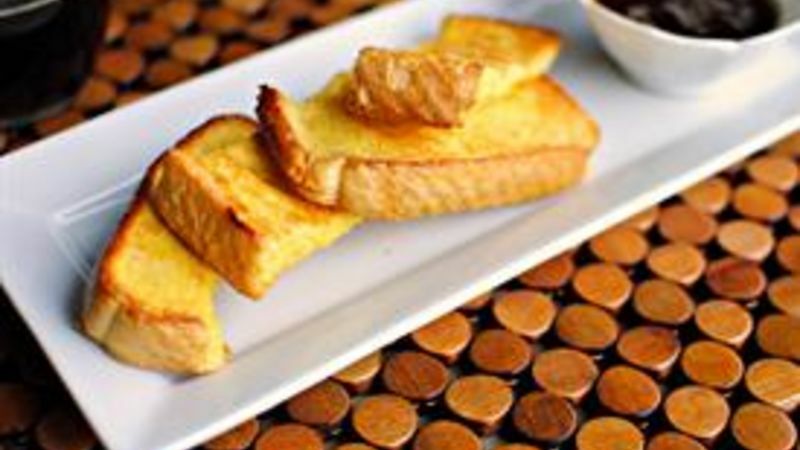 Season with salt, stir and serve with the warm french toast sticks.